Every one carries some things around with them every day. Items they wouldn’t be without – phone, wallet (or purse) and so on. Perhaps an electronic cigarette or a packet of the traditional kind with a lighter or book of matches. 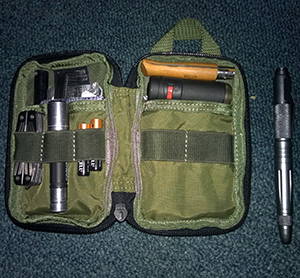 I’m interested in the skills and preparedness instilled by the disciplines of bushcraft and survival and – like many others (check out everydaycarry.com for plenty of examples) – I have expanded my EDC (everyday carry) kit to include a few items that could help in a more extreme situation than I face day-to-day. I’m not talking about a dedicated Survival Tin here. 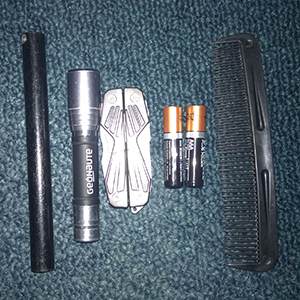 I do have one of those and may well post about it on this blog at some point but this EDC kit simply houses the items that I wouldn’t like to be caught without. I do get a bit of stick for the kit I’ve put together but it’s surprising how many times the “has anyone got a …” has been answered by my EDC kit and no-one else. I thought I’d share my kit and talk through the contents of my pockets. The first items in my EDC aren’t going to surprise anyone. My wallet is generally in my jacket pocket, within reach of my writing hand. In the right-hip pocket of my jacket I usually have my phone. Currently I’m using a Lumia 930 Windows 8.1 phone. Don’t judge me. I like the Windows interface, it has plenty of storage for my needs (plus synchronisation with my large OneDrive cloud storage), has a perfectly reasonable battery life and I don’t care about having thousands of apps. I have a wrist-watch that only leaves my person when I’m washing. 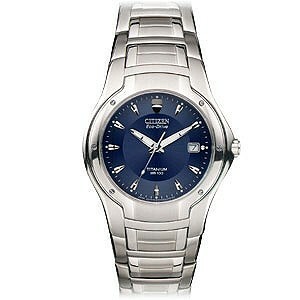 It’s a Citizen Eco-Drive, Titanium watch with a dark blue face. I really like this watch. It’s elegent, simple and robust. On top of that, the eco-drive solar re-charging means it will pretty much run forever. Handy for me as I seem to have a draining effect on watch batteries. Odd but seemingly true based on evidence. I like a watch with an analog face for two reasons. Firstly, it proves I can tell the time properly. Secondly, I can use it to help navigate if I become lost and can see the Sun. Alongside my wallet, I keep a pen. 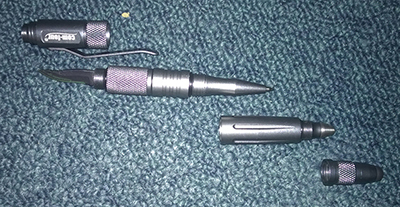 This is a multi-function pen that is made of a hard aluminium (aircraft grade) to ensure it stands a beating. The pen I have is a Com-Four B006 which I bought from Amazon.co.uk not long ago but seems to be unavailable at the moment. The pen includes a stylus for use on touch-screen devices, a glass-breaker, ink pen and a scalpel blade. This latter unscrews and I tend not to have it in the pen for most occasions. The pen uses the smaller D7 ink refills which can be purchased easily enough. The rest of my “must carry” items are located in my jacket pocket and are contained in a small pouch. 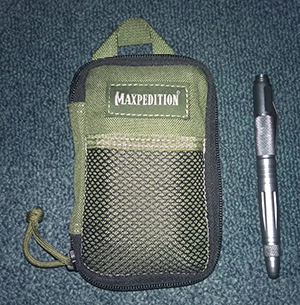 I opted for a Maxpedition Micro Pocket Pouch which cost about £15 and is a nice fit inside all my suit-jacket and blazer pockets. I got the pouch in green, but it’s available in a selection of “military” colours: Tan, Black and Green. Green’s my favourite colour so I went for that! Multi-tool. This is a small multi-tool that my daughter bought me for Christmas. It’s a Bear Grylls Compact Multi-Tool manufactured by Gerber. It has Needlenose pliers, Wire Cutters, Fine blade tool, Serrated tool, Phillips screwdriver, Small flat screwdriver, Medium flat screwdriver, Bottle opener and Tweezers. UK legal carry knife. A folding knife with no lock mechanism and a blade of no more than 7cm. I have an Opinel No. 5 Carbon Steel blade which costs around £7. The carbon steel (rather than stainless) requires more maintenance – oiling to prevent rust for example – but I can use the back of this knife’s blade as a striker. Opinel blades seem quite effective for their price band. 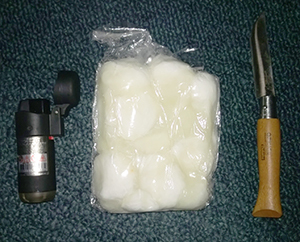 EDIT: 2016-07-06: I recently transferred a sharpening stone from my belt kit (which included another anyway) to this side of my pouch. I actually can’t remember where I got this from, but I think it’s a Small Arkansas Sharpening Wetstone (Soft) or similar that I picked up from The Bushcraft Store – where I actually buy a lot of kit. Kit that never really sees use, I have to say. I hope I never need to make use of the ferrocium rod and tinder due to being stranded, but am glad that I have them with me just in case. Other than these two items, I think the rest of this EDC kit covers the basics of modern life and a similar kit could be useful. Even just adding a multi-tool to your pocket litter can solve some of those everyday issues. Or you could think I’m crazy. If so, wait until I get around to posting about my survival tin or general out-door living kit!